Other Products by Balance Sports Nutrition. Search other Spirulina, Greens & Reds products. Balance Performance Greens are the perfect companion to any wellness program, or diet that is lacking in vital micronutrients and phytochemicals. Phytochemicals are plant-chemicals—all natural. There has not yet been an established RDI for phytochemicals—such as curcumin found in turmeric and lycopene found in tomatoes—which should not deduct from their importance. Though we can survive without these natural plant chemicals—unlike vitamins and minerals—they have been shown to support numerous biological processes, such as reducing inflammation and bolstering free-radical defenses, respectively. So, phytochemicals may not be necessary for survival, however, they are perhaps important for optimal health and chronic disease prevention1. Balance Performance Greens is loaded with phytonutrients, such as chlorophyll, lutein and kaempferol, found within chlorella, kale and broccoli, respectively. And with even more respect, these phytochemicals have been demonstrated to have antioxidant, eye-protecting and anti-inflammatory effects, amongst many others, respectively! Furthermore, Balance Performance Greens contains prebiotic fibres from chicory and corn, which support the growth and activity of the cultures that live within our gastrointestinal tract. These probiotics have many important roles, including supporting a competent immune response and healthy digestion and absorption. In fact, the human stomach is believed to contain a microbial species range of 100-1,0002. That's a lot of different bacteria, with, presumably, a lot of different roles to play in supporting human health. Balance Performance Greens contains 200 million probiotics per serve. 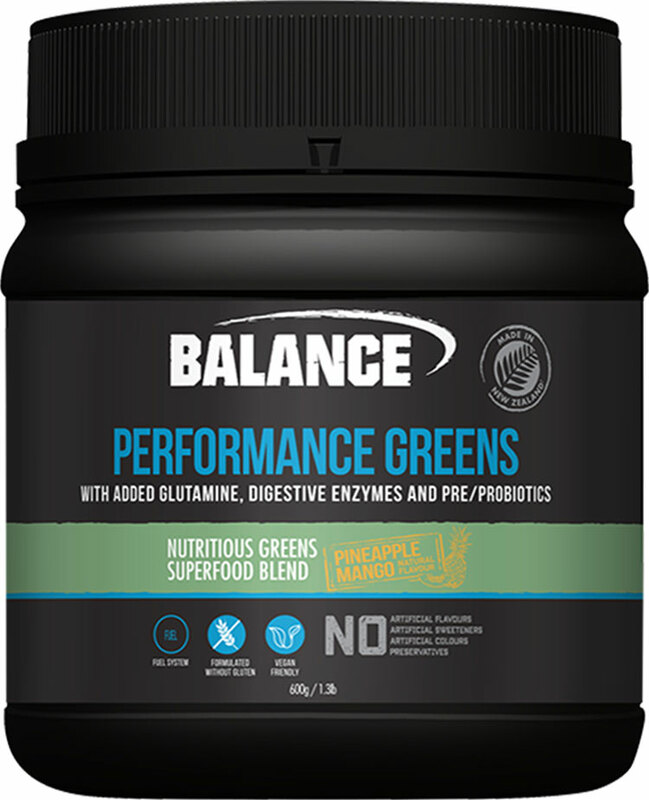 Balance Performance Greens also contains 1.67 grams of L-Glutamine per serve, which is a conditionally-essential amino acid believed to assist with the health of the gastrointestinal mucosa. L-Glutamine may also support immune function, focus and concentration. So if you're ready to lift general vitality and health to new found levels, try a daily dose of Balance Naturals Performance Greens. Who would benefit form using Naturals Performance Greens? When is the best time to use Balance Naturals Performance Greens? Use anytime before or after exercise. Consume 1 serve per day. Add 10g (2 level scoops) to 200ml of water. Shake or blend until mixed and serve. INGREDIENTS: Balance Performance Greens Blend (50%) [Spirulina, Broccoli, Spinach, Kale, Chlorella, Barley Grass, Wheat Grass], Prebiotic Fibre (Corn Fibre, Chicory Root Fibre), Glutamine, Natural Flavour, Digestive Enzymes (Bromelain, Papain), Probiotic (Bacillus coagulans), Natural Sweetener (Thaumatin). FORMULATED WITHOUT: Gluten, Artificial Flavours, Artificial Colours, Artificial Sweetener or Preservatives.